John’s Query is a staged work and a video series for three dancers set in Limerick’s St. John’s Square, exploring 1) our changing notion of the public square as both a location and a network, 2) mistranslations, and 3) the pursuit of shared perspective. 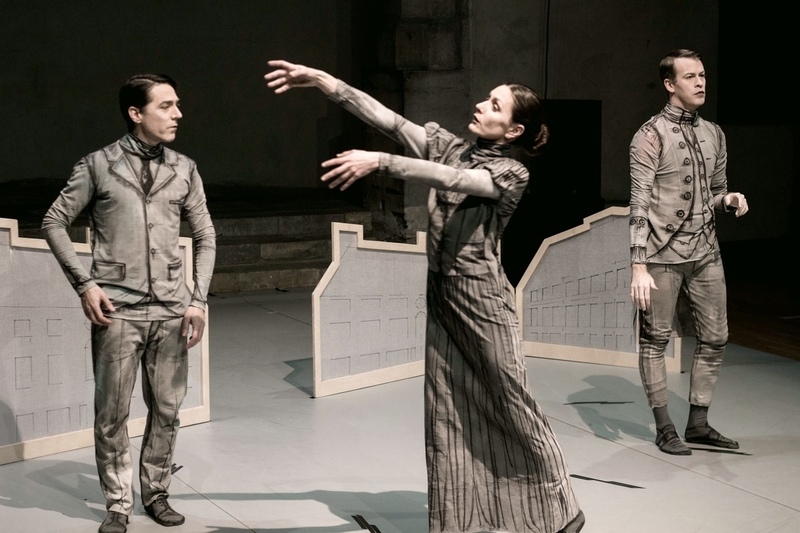 The three dancers (Angie Smalis IRE/GR, Mark Carberry IRE/UK, Colin Gee NYC) perform personae based on historical figures, all of whom inhabited St. John’s Square between 1700 and 1950. This anachronistic framing of communal life seeks a new understanding of what public life means in the context of twenty-first century connectivity and interdependence. As the lives of the characters intertwine in a farcical narrative involving expectation, faith, betrayal, and misunderstanding, the question is posed: Will people always betray others for the sake of their own interests? Ultimately, ‘’John’s Query’’ is about pursuit of (and sympathy for) the perspective from which the other can be understood, through humour, grace, longing, and melancholy. This dance piece proposes a path for a return to narrative in dance and character-based work, and addresses a distinct disciplinary opportunity to engage with a new kind of storytelling within dance. The artistic team involved in the project includes: Martin Shannon, Limerick based printmaker and visual artist designs and constructs a set that suggests the interiors and exteriors of the public square. Giordana Giache, knitwear and textile fashion designer and lecturer in Fashion and Textile Design at the Limerick School of Art & Design, consults on the costume design. Robin Parmar, Limerick based Canadian multidisciplinary artist, takes up the role of creative consultant, advising on the project’s dramaturgy. The projected is funded by The Arts Council, Limerick City and Co. Arts Office and supported by Dance Limerick, Limerick City and Co. Council, Firkin Crane, Project Arts Centre, and Limerick City Gallery of Art.